Many of you know that Bill has been managing a congenital heart condition, known as Hypertrophic Cardiomyopathy, since the mid 1990’s. Over the last few years, his heart function has declined, affecting his livelihood as well as his activities. In March, Bill was placed on standby to receive a heart transplant with a Status 1B, which allows him to wait at home until a donor heart becomes available. The long-term wait in our region is typically a maximum of 90 days, but Bill could be called for transplant at any time. 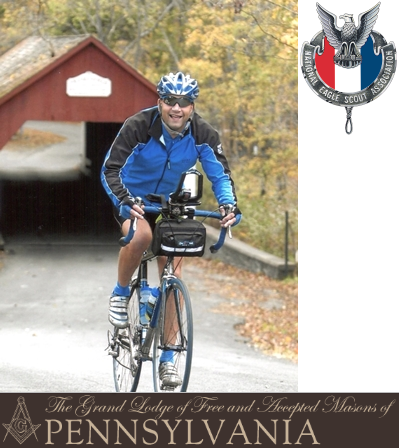 All of us who know and love Bill understand that it is his greatest wish to get back to cycling, both in the studio as a cycling instructor, as well as our ride leader in the great outdoors. We can’t wait for that day to come. We miss his endless stream of corny jokes, as well as the fastest flat tire changes known to man. Cycling, indoors or out, has not been the same without him! Although he has been unable to work due to his condition, Bill is also a skilled craftsman who has helped many people realize their visions of a new kitchen, a finished basement, or a beautiful deck. His handiwork is admired by all, and his work ethic and business integrity rewarded him with many satisfied customers. He also loves to travel and before he became so weak, we were fortunate to travel to France to see two stages of the Tour de France! Bill also spent a month in the U.K. visiting his daughter Amanda during her semester of study abroad. Bill is a member of Calvary Chapel of Philadelphia, and his faith and trust in God have been instrumental in helping him through this journey. Heart transplants are challenging, complex and costly. Recovery is grueling and lengthy – several weeks in the hospital – and more at home beyond that. Even with insurance, Bill will have many uninsured transplant-related expenses such as: co-pays and deductibles, doctor visits, and the costly immunosuppressant medications that he will need to take for the rest of his life. The situation presents Bill with a financial challenge that he cannot meet alone. We have chosen to fundraise with HelpHOPELive in part because HelpHOPELive assures fiscal accountability of funds raised and tax deductibility for donors. Donors can be sure that funds donated will be used only to pay or reimburse medically-related expenses. To make a tax-deductible donation to this fundraising campaign, click on the Yellow Donate Now button under the picture. While Bill is dealing with this unfortunate disease, he has been blessed by the incredible support of a wonderful network of friends, family and community. We want to say “thank you” for being part of our lives and for keeping him (and us) in your thoughts and prayers. Bill received the Gift of Life, his new heart, on Wednesday, June 17th! He’s recovering beautifully at the Hospital of the University of Pennsylvania (HUP) and sends everyone his love and thanks for all of the support he has received throughout this journey. The heart that Bill received is strong and steady and we are extremely grateful for the second chance that a brave and generous donor has provided to him. Please send your prayers or good thoughts to that person and that person’s family, as well as to Bill as he begins his recovery. We can't thank everyone enough for the overwhelming support. "SPIN FOR SOLOWAY" was a complete success!!!!! We will update the campaign album soon so all those who are not Facebook users can enjoy the great moments that were captured that evening. Please know we are deeply touched as we read through these lovely and inspiring messages and view the list of those who have generously donated. Some of you folks haven't even met Bill yet! But fear not, we will have more opportunities to come together and enjoy each other's company. Not everyone bikes, but everyone eats, right?! Just a little clue...Until then, remember, wake up every day grateful for the good health you have. Hey Bill, all the Capparelli's are praying for you. We know you will come through with flying colors when this is all over. Can't keep a good man down! I wish you only wonderful things from here on out! Hi Bill, I know Kathy from Yardley Fitness and she is one awesome lady...but I'm sure you know that already! She has been so encouraging and an awesome teacher to me. Our family will be praying for you! What a great and fun event last night at Optimal Fitness!! It was really good to see everyone - especially Bill & Kathy. The support and energy was incredible. Be well. Hi Bill, I saw your facebook posts, hang in there. Good luck with your upcoming surgery, hope all goes well, and a donor is available soon. My thoughts and prayers are with you. Hi Everyone! Bills "SpinForSoloway" page launched on Facebook today!!!! Head over and check it out. We think about you frequently and have you in our thoughts and prayers. Many blessings for good health and hope to see that warm smile of yours back on the trails soon. our prayers are always with you,god bless you bill. Wish we could be there with you! It will be great! Love you! Looking forward to the event. Jim and I have you in our prayers. See you soon. Bill, you will be back out and about, yes riding, before you know it! Hang in there!! Dennis B.